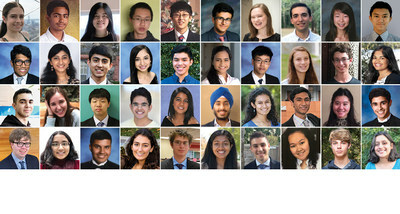 Forty of the Nation's Most Brilliant Young Scientists Named Finalists in Regeneron Science Talent Search 2019 | Regeneron Pharmaceuticals Inc.
Regeneron Pharmaceuticals, Inc. (NASDAQ: REGN) and Society for Science & the Public today named 40 finalists in the Regeneron Science Talent Search, the nation's oldest and most prestigious science and math competition for high school seniors. The competition, known as the Westinghouse Science Talent Search from 1942-1997 and the Intel Science Talent Search from 1998-2016, is designed to engage and inspire the next generation of scientific leaders. Alumni have gone on to win the Nobel Prize, found successful companies and invent groundbreaking medical treatments. Finalists were selected from a pool of nearly 2,000 highly qualified entrants, all of whom completed an original research project and extensive application process. Earlier this month, the Society and Regeneron named the top 300 scholars. The finalists, who were selected based on their projects' scientific rigor and their potential to become world-changing scientists, were selected from that pool. Finalists' projects span a diversity of STEM-related topics and this year include building new models to predict refugee migration in Burundi, identifying novel therapeutic approaches to potentially improve precision care for leukemia and developing an automated 3D printed IoT (Internet of Things) sensor to detect arsenic in groundwater. The finalists will travel to Washington, D.C. from March 7-13, 2019, where they will undergo a scrupulous judging process and compete for more than $1.8 million in awards. They will also have the opportunity to interact with leading scientists, meet with members of Congress and display their projects to the public at the National Geographic Society on March 10. "The Regeneron Science Talent Search finalists are our country's most promising young scientists, and I'm thrilled to congratulate them on this outstanding academic achievement," said George D. Yancopoulos, M.D., Ph.D., President and Chief Scientific Officer of Regeneron and Science Talent Search winner (1976). "I will never forget how participating in the Science Talent Search back when it was sponsored by Westinghouse changed my life and gave me the inspiration and confidence to pursue a career in science. I can only hope these amazing young scientists build on their success in this year's event and go on to use their scientific talents to address the many urgent challenges we face as a society, from climate change to disease." "This year's Regeneron Science Talent Search finalists are helping to advance solutions to some of our world's most intractable challenges," said Maya Ajmera, President and CEO of Society for Science & the Public and Publisher of Science News. "I'm so impressed by the hard work and brilliant thinking these 40 exceptional students have demonstrated in their research projects. I look forward to meeting them in D.C., and I am excited to see how their passion for science will impact our world." For a list of this year's finalists, visit https://student.societyforscience.org/regeneron-sts-2019-finalists. The Regeneron Science Talent Search, a program of Society for Science & the Public since 1942, is the nation's oldest and most prestigious science and math competition for high school seniors. Each year, around 2,000 student entrants submit original research in critically important scientific fields of study and are judged by leading experts in their fields. Unique among high school competitions in the U.S. and around the world, the Regeneron Science Talent Search focuses on identifying, inspiring and engaging the nation's most promising young scientists who are creating the ideas that could solve society's most urgent challenges. In 2017, Regeneron became only the third sponsor of the Science Talent Search, increasing the overall awards distribution to better reward the best and brightest young minds. Through its 10-year, $100 million commitment, Regeneron nearly doubled the overall award distribution to $3.1 million annually, increasing the top award to $250,000 and doubling the awards for the top 300 scholars and their schools to $2,000 each to inspire more young people to engage in science. Program alumni include recipients of the world's most coveted science and math honors, including 13 National Medals of Science, five Breakthrough Prizes, 19 MacArthur Foundation Fellowships, two Fields Medals and 13 Nobel Prizes. Regeneron (NASDAQ: REGN) is a leading biotechnology company that invents life-transforming medicines for people with serious diseases. Founded and led for 30 years by physician-scientists, our unique ability to repeatedly and consistently translate science into medicine has led to seven FDA-approved treatments and numerous product candidates in development, all of which were homegrown in our laboratories. Our medicines and pipeline are designed to help patients with eye diseases, allergic and inflammatory diseases, cancer, cardiovascular and metabolic diseases, neuromuscular diseases, infectious diseases and rare diseases. We believe that scientists should be the world's heroes and are committed to fostering the next generation of scientific talent through STEM (Science, Technology, Engineering, Math) education efforts. For additional information about the company, please visit www.regeneron.com or follow Regeneron on Twitter and Facebook.